Geoff Cook is to leave his role as director of cricket at Durham after 27 years with the club. 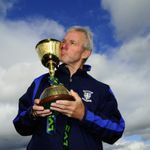 Director of cricket Geoff Cook to leave Durham as part of ‘staff restructure’ By Joe Shread Last Updated: 18/09/18 9:01am Geoff Cook helped Durham to three County Championship titles during his time with the county Geoff Cook is to leave his role as director of cricket at Durham after 27 years with the club. Cook, who also previously played for and coached Durham, said: “It comes with a heavy heart that I am leaving my role but I’m immensely proud of the work we have achieved during my 27-year stay. Cook joined Durham as a player in 1991 and has been with the club for 27 years “There are too many people to thank but I would like to show gratitude to all the players, staff, members and supporters I have worked with and of course my family and friends. Cook, who represented England in seven Tests during his playing career, helped to oversee the development of the likes of Ben Stokes, Mark Wood and Steve Harmison during his time at Durham. Club chairman Sir Ian Botham paid tribute to the 66-year-old, saying: “Geoff is a true legend of the club and his instrumental work has had an immeasurable impact on the success of Durham.